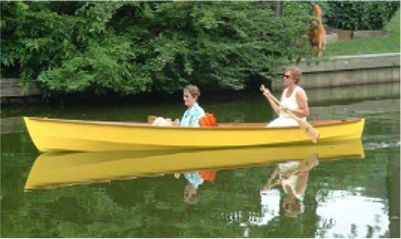 The Lynnhaven 16 is designed for those who want a family fun boat that they can build themselves. I built the prototype in 3 weeks of weekends and evenings, total less than 100 hours of single-handed work. This is about as much boat as can be built from 3 sheets of plywood, with very little scrap left at the end of the project. 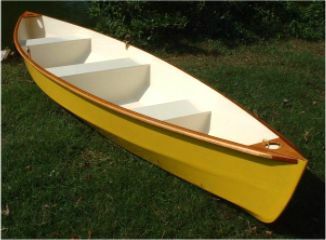 I built the prototype from 6mm (1/4") plywood, which produced a robust boat but a bit heavy at 32kg (70lb). It can be built from 3mm (1/8") plywood to about 20kg (45lb) or anything between. Construction is stitch-&-glue, so it is suitable as a first time boatbuilding project. The plans include full size paper patterns showing every plywood component, nested for marking straight onto the plywood sheets. A set of step-by-step instructions is also supplied, including more than 40 colour photos of the entire building process. The Lynnhaven 16 is suitable for exploring your local rivers and lakes, or it can be car-topped across the country for camp cruising waters far away.